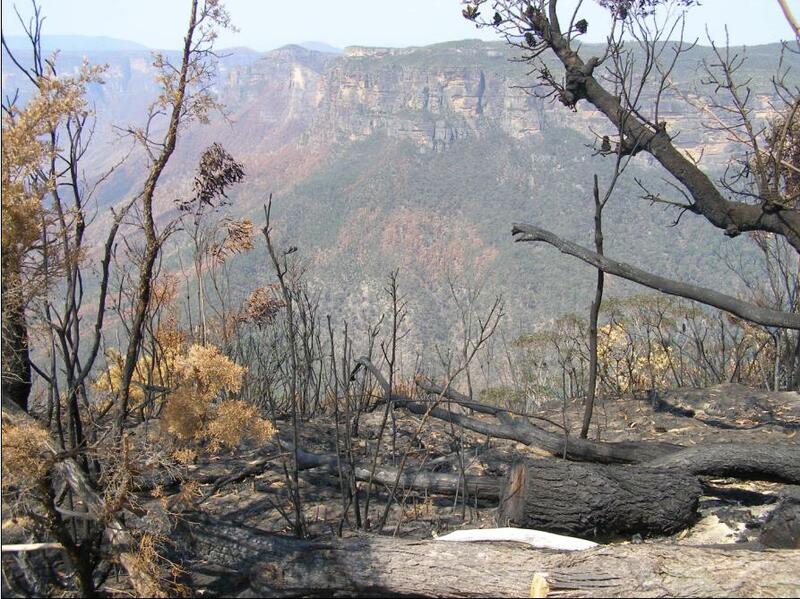 Following the devastating Grose Valley bushfires of November 2006 in New South Wales (Australia), which burnt out 14,070 hectares of high conservation bushland in and around the Greater Blue Mountains World Heritage Area, the editor (a nearby resident and witness) wrote to the head of the NSW Rural Fire Service. The letter raised serious concerns about bushfire management and offerred constructive recommendations and a detailed operational reform initiative. The letter was not responded to by the Rural Fire Service. looking from Govett’s Leap, Blackheath. Thank you for your reply letter of 24-Dec-07. I appreciate the efforts of your staff to search and to try to provide this information that I have requested about the operational reports and costs directly associated with the Grose Fire of November 2006. I am particularly grateful for the co-operative communication provided by Justin Walsh at NSW Rural Fire Service (RFS) headquarters. I have some questions about the information provided in respect to the RFS recording of events and costs associated with this major fire. I wish to also offer some observations and make recommendations that I will appreciate you taking on board by way of ongoing quality improvements to fire management policy and practices. In this regard, I have had some brief communication with the local Superintendent District Manager of the RFS in the district where I live (the Blue Mountains), Mal Cronstedt. Mal Cronstedt as you will be aware, was the Incident Controller of the Grose Fire. As courtesy I shall send him a copy of this letter as well as the information you have provided me. I will also appreciate you passing on a copy of this letter to the NSW RFS Commissioner, Mr Shane Fitzsimmons and advise that I will also welcome his feedback. I am surprised by your reply that the RFS does not have any record or minutes of the operational meeting immediately following the Grose Fire. The reported inter-agency review that took place at Katoomba on 19th December 2006 some three weeks after the fire would have included critical operational information about the Grose Fire. The accurate hands-on operational feedback from fire fighters would have proved invaluable in preparing the formal Section 44 Incident Controller’s Report into this fire. Such operational information, feedback and assessment would be invaluable in providing increased understanding of the fire incident and fire behaviour, of resource utilisation and of management handling and decision making during the fire. This would support fire investigation efforts and facilitate analysis of the fire and of fire fighting performance and effectiveness. It would be a valuable addition to the wealth of strategic and operational fire knowledge to the local fire command to help them take remedial actions to improve fire management standards and resourcing. However, without any operation records of this major fire incident such benefits have been lost. I have asked Justin Walsh at RFS headquarters to also find out if any reports or meeting minutes exist by either Fire Captains at Katoomba or Lithgow from where the fire fighting of the Grose Fire was jointly controlled. If such information exists then I shall be applying for an additional Freedom of Information request for this. Given the considerable monetary cost of this fire, the extensive resources required to combat it and bring it under control, the wide media attention it attracted and the public outcry as a result of the damage to the Blue Gum Forest, it would seem inconceivable that no records, field notes or daily records exist about the fire’s progress and of decisions and actions taken by fire management. If so, this suggests a serious disconnect between executing fire suppression operations and monitoring those operations. This surely would undermine performance management planning and review systems within the RFS. It sends a message to the community that the RFS is not accountable. I have concerns that this plan is not transferring into practice. Last month I outlined to Mal Cronstedt a recommended reform initiative ‘Compulsory Fire Event Logging’. This reform initiative proposes to standardise and make compulsory a Bushfire Event Log for every registered fire in New South Wales. This would seek to capture all quantitative and qualitative information about a fire. The purpose of a Fire Event Log would be to capture and consolidate all information associated with combating a fire into one document for operational analysis and future reference use. I look forward to Mal’s feedback on this recommended reform. The expenditure summary that you have provided seems to be an internal RFS accounting report limited to the direct recorded outlays of the RFS associated with the Grose Fire. Direct and indirect operating costs incurred by all fire fighting authorities fighting the fire including NSW Rural Fire Service (RFS) – both local and Inter-District, NSW Fire Brigades (NSWFB), Department of Environment & Conservation (NSW) – (NSW National Parks and Wildlife Service (NPWS)). Any direct operating costs of the fire not paid for by the RFS due to funding, subsidies or rebates provided by government agencies outside the RFS. Direct expenses of related injury and accident claims of personnel directly involved in fighting the fire, including the cost of WorkCover claims, related payouts and lost time at work. Economic loss valuations of property, plant and equipment damaged as a direct result of the fire. This includes those of owners of land and infrastructure such as DECC, Blue Mountains City Council, RailCorp, Sydney Catchment Authority, Integral Energy, Telstra, the NSW Roads and Traffic Authority and private land owners, including insurance claims. Importantly, here I am not seeking to obtain the broader social and environmental costs, which though relevant, would understandably be more difficult to estimate and obtain. Instead, I am merely seeking those accounting costs that can be reasonably and justifiably attributed to this fire. Such costs must be recorded respectively by each organisation as part of Australian financial accounting practices. Does the RFS have access to these costs? Does the RFS maintain a database that captures all direct and indirect costs of each major bushfire in NSW? If not, does the RFS have any plans to start capturing Total Fire Costs of major fire or indeed to capture the Total Fire Costs of each registered fire incident during each financial year? I propose that the RFS should capture the Total Fire Costs for each major fire and, to be comprehensive, for all registered fire incidents to which the RFS responds. The expertise for this task may well require the assistance of an outside audit firm. However, the benefit of this to the RFS and to the community will be considerable in highlighting the Total Fire Costs of fighting fires in New South Wales, which I argue we still don’t know with any reliably accuracy. I expect that for the Grose Fire for instance, the Total Fire Cost will be a considerably larger figure than the internally recorded accounting records of the RFS of $6.1 million. resource itself to better suppress bushfires. I understand that between 2003 and 2007 the Bushfire Co-operative Research Centre (Bushfire- CRC) with RMIT University completed a research project, which involved researching the ‘true costs of bushfires’. It would be useful to seek the reports from this project. As an RFS policy, that for each major fire incident declared under Section 44 of the Rural Fire Act 1997, I recommend that both an Incident Controllers Report together with the Total Fire Costs of Fire be provided by the RFS to the Minister for Emergency Services. I will welcome your feedback and the opportunity to participate in reforms to fire management across NSW. This reform initiative proposes to standardise and make compulsory a Bushfire Event Log for every registered fire in New South Wales. The purpose of a Fire Event Log is to capture and consolidate all information associated with combating a fire into one document for operational and reference use. Typical information about a fire is to be sourced from fire management decision-making, deployment instructions, radio communications from fire-fighting crews, observations by airborne crews, current weather statistics from the Bureau of Meteorology and relevant information received from other emergency services (NSWFB, Police, Ambulance, SES, etc) associated with a subject fire. The Fire Control Centre of each Rural Fire District in New South Wales must establish and maintain a separate Fire Event Log of each registered fire occurring, either wholly or partially, within its Rural Fire District. A minimum Australian standard of vital fire information necessary for a Fire Event Log must be established and approved by the NSW Rural Fire Service Commissioner. This standard must be reviewed annually ahead of each peak fire risk season. A suitable training programme in Fire Event Log Procedures must be established to enable suitable fire personnel to be trained in order to competently maintain a Fire Event Log to the minimum Australian standard. This policy should be integrated into the RURAL FIRE SERVICE Standard Operating Procedures once a process of consultation with all relevant personnel has been extensively undertaken across the entire breadth of the organisation. Once approved, a Fire Event Log Policy and Procedures should be gazetted into the Rural Fires Act (NSW), 1997 and considered similarly for each fire authority in each Australian State. The Fire Control Centre of each Rural Fire District across New South Wales must establish a new and separate Fire Event Log upon becoming first aware of any fire within its fire district. A Fire Event Log must be maintained continuously throughout the duration of a fire within a Fire District until such time as the responsible Fire Control Officer (or higher RURAL FIRE SERVICE command) declares the fire extinguished within that district. A Fire Event Log must be recorded using the RURAL FIRE SERVICE central computer system, with appropriate daily data back ups generated at the end of each day. The Fire Control Officer for a given Rural Fire District is ultimate responsibile and accountabile for establishing and maintaining an accurate and thorough Fire Event Log for each fire in its district. A Fire Control Officer may only delegate the task of maintaining a Fire Event Log to a qualified fire fighter holding a current endorsement in Fire Event Log Procedures. When a fire takes the form of combined fires or multiple fire fronts within reasonable proximity in a geographic area, the responsible Fire Control Officer may order that a single Fire Event Log be maintained for the combined fires/multiple fire front. Regular communication must be maintained between the Fire Control Centre and field brigades fighting a fire to facilitate logging fire activity to a minimum standard that allows communications at a minimum interval of 15 minutes. Any communications failures or difficulties between firefighting crews (ground and airborne) and Fire Control, or any problems experienced in maintaining a minimum 15 minute communications frequency, must be immediately reported by the Fire Control Officer, or in the case of a major fire incident, to the Incident Controller. A Fire Event Log is to be deemed the official single register of a fire event, a core operational document and a legal document admissible in a court of law. As an internal document, a Fire Event Log is not automatically available for public access. The RURAL FIRE SERVICE Commissioner may at his/her discretion allow public access to such a document via a Freedom of Information Request from a member of the public. The integrity and security of a Fire Event Log is paramount and is the ultimate responsibility of the Fire Control Officer assigned to a given fire. A digital copy of Fire Event Log must be provided by a Rural Fire District branch to RURAL FIRE SERVICE Headquarters within 7 days of the fire being declared extinguished. A secure and accessible database of Fire Event Logs is to be maintained by both the respective Rural Fire District branch and for all fires across NSW by RURAL FIRE SERVICE Headquarters. While it is acknowledged that the author is not a member of the Rural Fire Service and so not privy to Rural Fire Service policy and procedures for recording bushfire operations, the lack of operational detail provided the Section 44 Incident Controllers Report for the Nov-06 Grose bushfire and the absence of minutes from the subsequent Inter-Agency review on 19-Dec-06, highlight shortcomings in record keeping of fire operations. Perhaps much of the information reported of bushfire events is obtained from personal recollection of events from individual line personnel a considerable time after the event. For instance, the Section 44 Report into the Grose bushfire (14-Nov-06 to 3-Dec-06) is dated 8-Feb-07, two months later. There are obvious problems relying upon recollecting detailed events, the precise time and order of those events, the changing fire behaviour, the decisions made and actions taken and the changing conditions at the time. The absence of a factual minute by minute event log makes it difficult to be accurate and comprehensive in reporting major bushfire incidents. In the event of a major fire, maintaining a Fire Event Log will provide a record the performance of the four ICS functions – control, operations, planning and logistics. It may well be that bushfire agencies in each Australian state have their own methods and protocols for recording fire events. It may also be that different agencies and indeed different regional branches have their own different ways of recording bushfire event data. There is likely no universal consistent standard across Australia of recording bushfire events as they occur. Some records may be better than others. There is a need to have a consistently high standard of record keeping for bushfire events across Australia. Recent coronial inquests in Australia into bushfire deaths (Canberra Bushfire Jan 2003, Eyre Peninsula Fire Jan 2005), highlight the need for fire authorities need to have accurate records of bushfire events so that they are better able to defend their actions in court. The benefits of establishing and maintaining a Bushfire Event Log is to better enable bushfire management to achieve an accurate and comprehensive record of a fire – the events, decisions and actions and outcomes associated with each fire event. All relevant operational data associated with a fire will be recorded in one convenient document. A Bushfire Event Log will provide a reliable source document for preparing a fire incident report. This will avoid the often difficult task of having to recall events, the order of those events, decisions made along with the fire behaviour at the time, long after a fire sometimes days or weeks later when memories have faded. Recent reports and inquests have highlighted failures in fire-fighting communications, which arguably had a role in contributing to operational problems in controlling the spread, severity and impacts of fires. Compulsorily requiring a Bushfire Event Log will require regular communication between fire-fighters and Fire Control. This requirement will help drive the need to improve the reliability of operational communications during a bushfire event. A Bushfire Event Log will provide a actual live record of the performance of the co-ordination, command and control functions of the ICS, including the operational sequence: Reaction, Reconnaissance, Appreciation, Plan, Issue of Orders and Deployment. This log will be highly useful at a debriefing session following a fire, allowing operational problems to be better identified. This will aid the RURAL FIRE SERVICE to increases its knowledge and understanding of rural fire fighting. A Bushfire Event Log will enable bushfire management to be more transparent in reporting its operations, assisting any possible coronial investigations, for operational evaluation and improvement, analysis and to contribute firefighting practice into bushfire research. By making fire event logging compulsory, regular information must be fed back to central command in order to achieve the minimum reporting standard. This will drive a higher standard in strategic communications. 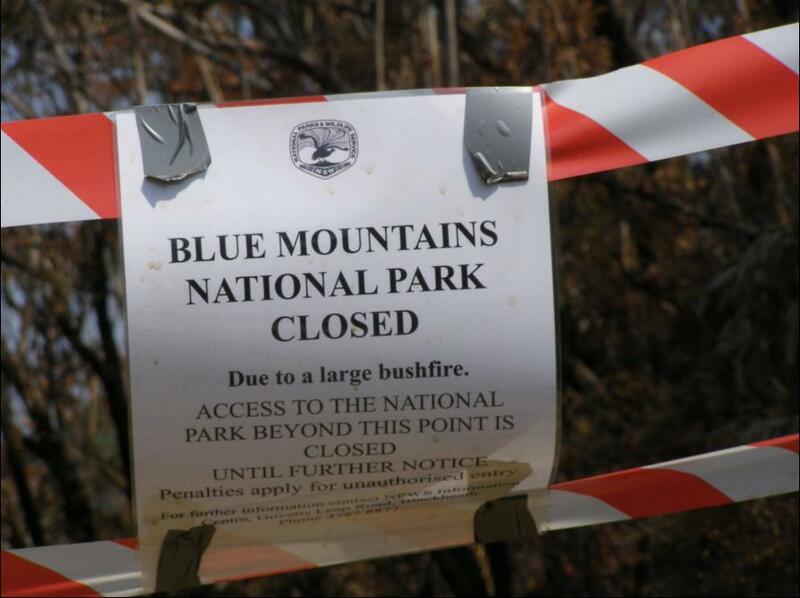 This entry was posted on Friday, August 20th, 2010	and is filed under Blue Mountains (AU), Threats from Bushfire.